A new fruit and veg stall offering affordable produce for students and staff has been launched at Teesside University. 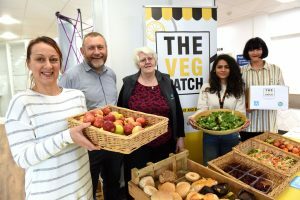 The Veg Patch project is run by Hazel Wright, the University’s Wellbeing Services Co-ordinator, and will be in the Middlesbrough Tower foyer every Friday from 11.00am until 2.00pm. It offers produce which is surplus to requirements and people can pay as much as they feel, making fruit and veg more accessible and affordable. All money raised goes back in to running the project. In addition, customers are offered information about healthy eating and given recipes to help them cook up something new. Hazel has been working with Co-op, which is supplying the surplus fruit and veg. She has also teamed up with Middlesbrough Environment City which is running the Veg Power project, a national campaign to encourage young people to eat more fruit and veg. “I have been keen to set up the Veg Patch for a while now and, as well as encouraging people to eat healthily, it also gets them thinking about food waste,” explained Hazel. This entry was posted in News on February 12, 2019 by rachael.